Red Apple Ranch’s home town of Murphys was a direct result of the great and historic California Gold Rush. The Sierras and Sierra Foothills were once thought to be lined in gold and, in the 1800s, gold mining and panning brought thousands to the area, giving birth to town after town throughout the hills. While mining began to dry up pretty quickly in the area, one mine managed to pop up within the last few decades. 40 miles northwest of Murphys is Sutter Gold Mine. Opened in 1989 as a fully functioning gold mine, Sutter Gold Mine quickly lost steam as the price of gold dropped and the cost of mining rose. The owners opened the mines up for tours and have created not just a successful business and attraction, but a welcome and appreciated addition to the residents of the Sierra Foothills. Open for one-hour walk tours, the mine offers a comprehensive look into the gold mining process and its historical progression from gold panning and hydraulic mining to hard rock techniques. 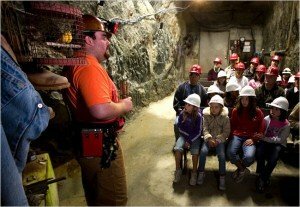 As it teaches a great lesson on gold mining, geology and mining technology, it offers up the incredibly fun and exciting opportunity to go deep underground and see the caverns through the eyes of the a gold miner.